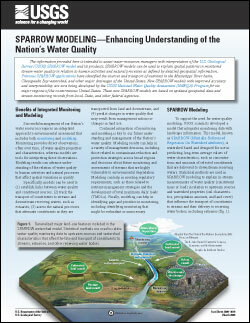 The information provided here is intended to assist water-resources managers with interpretation of the U.S. Geological Survey (USGS) SPARROW model and its products. SPARROW models can be used to explain spatial patterns in monitored stream-water quality in relation to human activities and natural processes as defined by detailed geospatial information. Previous SPARROW applications have identified the sources and transport of nutrients in the Mississippi River basin, Chesapeake Bay watershed, and other major drainages of the United States. New SPARROW models with improved accuracy and interpretability are now being developed by the USGS National Water Quality Assessment (NAWQA) Program for six major regions of the conterminous United States. These new SPARROW models are based on updated geospatial data and stream-monitoring records from local, State, and other federal agencies. Preston, S.D., Alexander, R.B., Woodside, M.D., and Hamilton, P.A., 2009, SPARROW MODELING—Enhancing Understanding of the Nation’s Water Quality: U.S. Geological Survey Fact Sheet 2009–3019, 6 p.